For decades, people have searched for ways to harvest energy from natural sources. Lately, a desire to address the issue of global warming and climate change has popularized solar or photovoltaic technology, while piezoelectric technology is being developed to power handheld devices without batteries, and thermoelectric technology is being explored to convert wasted heat, such as in automobile engine combustion, into electricity. 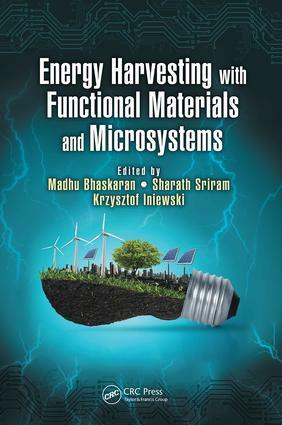 Featuring contributions from international researchers in both academics and industry, Energy Harvesting with Functional Materials and Microsystems explains the growing field of energy harvesting from a materials and device perspective, with resulting technologies capable of enabling low-power implantable sensors or a large-scale electrical grid. Whether you’re a practicing engineer, academician, graduate student, or entrepreneur looking to invest in energy-harvesting devices, this book is your complete guide to fundamental materials and applied microsystems for energy harvesting.